Oxygen 49 gives you the same control, flexibility and power as our Oxygen 61, just with an octave fewer keys to accommodate tight spaces and even greater mobility. You get the same quality keyboard, built-in MIDI interface and knobs, sliders and buttons totaling 35 MIDI-assignable controllers for complete control of your hardware and software. Store 10 different setups in on-board non-volatile memory, plus manage an infinite number with our free Enigma software for Mac and PC. 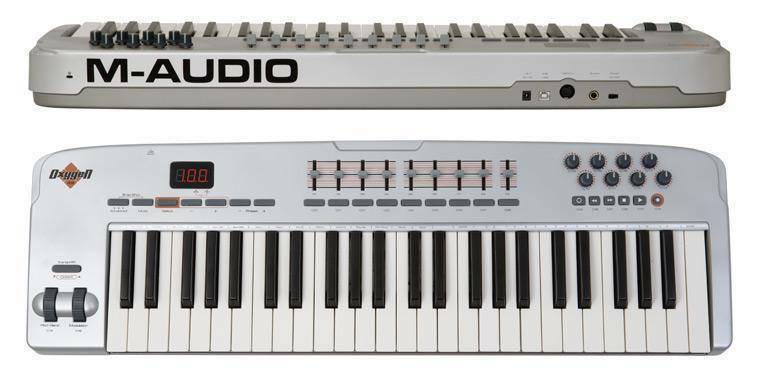 Bus-powered operation and a weight of only 7.5 pounds lets you play, compose, record and mix with ultimate mobility.